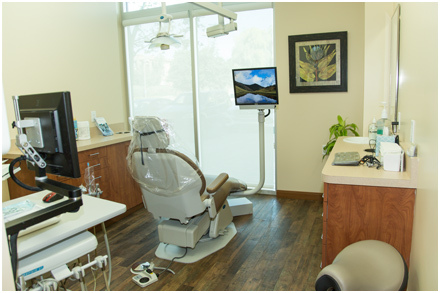 At Parkside Dental, your comfort is our first concern. We realize that many people are nervous about seeing the dentist, and it is important to us that you are as comfortable as possible. Discomfort from a dental shot is mostly due to the feeling of pressure created by the flow of dental anesthetic. We use a computer controlled injection system called the Wand, which greatly relieves this discomfort. The Wand doesn’t look like a traditional syringe, so the initial apprehension is minimized. The Wand can be positioned more accurately and has a controlled novocaine flow rate, delivering the correct amount of anesthetic at a rate that is painless. The source of most discomfort from novocaine injections isn’t the needle. It’s the flow of the anesthetic into the tissues of the mouth. Unlike traditional syringes, the Wand delivers anesthetic at an optimal flow rate for a comfortable, pain-free injection. Relaxant Gas is nitrous oxide gas which you breathe in and out through your nose via a small nasal mask. This has the effect of making you very relaxed during your treatment. The effects of the gas wear off within a few minutes of stopping the gas, allowing you to drive home safely. We need the bright light in order to see into your mouth properly, so we provide you with tinted safety goggles to shield your eyes. CD players with a variety of music and Netflix movies are available for your listening and viewing pleasure. Ask us for a blanket if you are feeling chilly. The human element of care, understanding, and compassion are probably the most important in eliminating nerves. We believe we score high in this category, as we are all genuinely nice to each other.